We make our bannister ropes using our synthetic hemp rope and finish them with a decorative knot each end. Chrome, Brass or Gun Metal brackets can be selected. Standard length is 12 foot but we can make different lengths if required - please call us with your requirements. Since we make all rope bannisters to order please allow 7-10 working days for completion and delivery - if you have a specific deadline or date requirement for your bannister rope please get in touch and we will do everything possible to accommodate your request. 24mm diameter Synthetic Hemp rope assembly with solid brass,chrome plated or gun metal fittings. Fully assembled and ready to fit to the wall. The rope is finished with a decorative knot at each end and there are 4 wall fixing brackets. 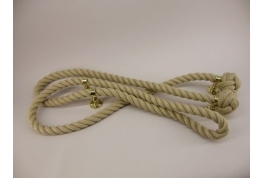 Our standard stair rope is 12 feet long, but different sizes can be made to order. Please contact us for further details. 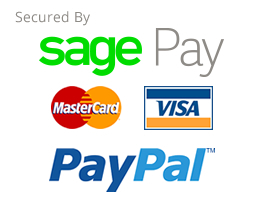 The wall fixing brackets will be secured to the rope at approximately 1 metre spacing, unless requested otherwise. 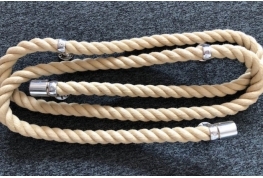 Stair Rope made from 32mm diameter Synthetic Hemp rope complete with either brass, chrome plated or gun metal fittings. Fully assembled and ready to fit to the wall. The rope is finished with a decorative knot at each with 4 wall fixing brackets. 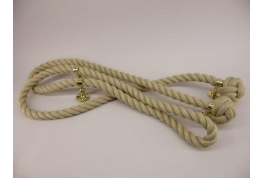 Our standard stair rope is 12 feet long, but different sizes can be made to order. Please contact us for further details. Stair Rope made from 24mm or 32mm Synthetic Hemp Rope. Complete with 4 wall brackets and finished with our new rope end caps. Available with Brass, Chrome or Black Nickel fittings. Our standard length is 12ft but we can manufacture any length to order - please feel free to call Cheap Rope on 01634 295880 if you have a specific requirement.